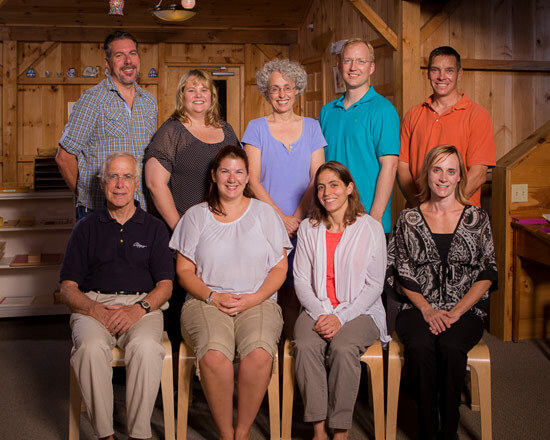 Montessori Discovery School is a not-for-profit school governed by a self-sustaining Board of Trustees and managed by a Head of School. Board members are often current or past MDS parents. The Board plans for the future, maintains the financial stability of the school and establishes broad policies. The Head of School manages the school on a day-to-day basis. Board terms are for 3 years and members lead or serve on a board committee. The Board of Trustees meets monthly throughout the year. is an architect, designer & builder who studied at the Cooper Union in New York City. He currently resides in Stonington Borough with his wife Annamaria and daughters, Sasha (elementary student) and Sabina, (primary intermediate student). Together they enjoy the great outdoors, travel & visual arts. has served as Montessori Discovery School’s head of school since 1986. She first visited the school in 1983 while looking for a program for her then 3-year-old son, Robert. Patrice has Bachelor and Master of Arts degrees in American History from Connecticut College and a Senior Certificate in Conflict Resolution from the University of New Haven. She attended the first Montessori Administrator training course at the Center for Montessori Teacher Education in 1987-88. Effective communication is of particular interest to her. Patrice and the MDS staff have developed a communication model, ongoing communication training and staff retreats which help make MDS the very special place it is. Patrice enjoys reading, knitting, 18th-century architecture, storytelling and spending time with her grandsons, Henry and John Paul. is self-employed as the CFO for Loss Solutions Group. Before moving back to Connecticut in 2005, she spent 8 years in California going to school and working as an accountant. Stacey joined the auction committee during her son’s first year in the primary program and chaired the committee the following year. After 2 years of working on various MDS fundraising projects, Stacey joined the board as Fundraising Chair. Stacey lives in Canterbury with her husband Rich, her son Adam, who is in the elementary program, and her younger son Noah, who is a primary student. is the Executive Director of the Southeastern Regional Action Council (SERAC), a non-profit that serves the 20 communities in the region to reduce the impact of substance abuse and other addictive behaviors. Her past career in mental health gave her the determination to create a strong infrastructure for prevention in the region. Michele now is very active in statewide programs and advocacy for laws related to substance use and other at risk behaviors in youth. Michele has a Masters degree in Student Personnel in Higher Education and Mental Health Counseling. She has coordinated a variety of adolescent and parenting programs for communities in the region. Her true success is her family! She is married and the mother of two boys, Jack and Brennan. is the Director of Planned Giving at the University of Connecticut Foundation. He holds a PhD in German from Washington University in St. Louis and a JD from Saint Louis University. Originally from Ohio, he came to Norwich by way of Delaware, Germany and St. Louis with his wife, Suzuko, a professor of German at Connecticut College and their son, Auggie, currently a primary student at MDS and a big fam of the short and long number chains. has been a mechanical engineer at Electric Boat for fourteen years, where she is responsible for the design and construction support of various mechanical and electro-mechanical systems. Her daughter, Dana, is in the MDS elementary program. Over these years, she has watched her thrive in the school’s environment. Dottie joined the Board of Trustees to be more involved with what has become such an important part of her family’s life. is a freelance writer with a non-fiction book and many magazine and Internet articles to her credit. Before the birth of her first child, she worked as a public relations specialist for a non-profit organization serving more than 10,000 girls and adult volunteers in central Massachusetts. Her interest in writing, which came into being the very day she realized that the letters of the alphabet could be combined to form words, has been a guiding force in her personal and professional endeavors ever since. She lives in Salem. Elizabeth and her husband, Chris, have a daughter in the elementary program at MDS and a son hurrying to catch up. is the owner of Laser Contracting LLC of Preston, a building and remodeling company. Scott has owned and operated his company for the past fifteen years and specializes in energy efficient building practices. Scott received his BA in mathematics with minors in health and German from Plymouth State College in New Hampshire. is a recycled Board Member, having previously served as Treasurer twenty-some years ago when his son, Ben, was at MDS. His work history is diverse ranging from his days as an Army Company Commander in Korea and Vietnam, to motor racing in Australia, artificial breeding in New Zealand, a year at the South Pole while working with the U.S. Antarctic Program, construction management in Alaska and Upper Michigan, manufacturing in East Hampton, VP/CFO at United Community Services, and Manager of Financial Services at the University of Connecticut. He is now mostly retired to allow adequate time for bicycling, though he continues to teach a course at UCONN focused on leadership in Antarctic exploration. He has degrees from West Point and MIT.